Longistics is a full-service provider of global logistics services, with a long history of technological innovation and superior customer service. We create customized logistics solutions for companies like yours, allowing you to focus on what you do best. We specialize in serving the pharmaceutical industry, and have built one of the industry's best records for on-time delivery, cargo integrity, safety and security. We are a leading provider of third-party logistics, with worldwide reach and a growing presence in China and other emerging markets around the world. We are North Carolina's premier operator of Foreign Trade Zones and control a multi-million dollar real estate portfolio within them, ideal for manufacturing plants, exhibition and display facilities and warehouse/distribution operations. To learn more about how Longisitics can bring a higher level of efficiency, reliability and cost-effectiveness to your logistics operations, please call 1-800-289-0082. 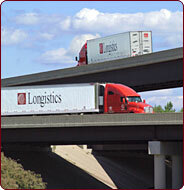 Longistics exists to serve the varied needs of our customers. Service, Safety and Security are obsessions with us. It is our belief that our achievements in these areas will yield loyalty - we to our customers and our customers to us - resulting in long-term business relationships. We have an aggressive organizational structure. If you need an answer, we can get you one quickly. We will always invest in our firm to ensure our future and that of our customers. We will always employ the best available talent. We believe people deserve to be treated with dignity and respect, and that they are productive and deserving of recognition. We will not engage in unethical or illegal business transactions. We will not associate with firms or people who participate in such actions. As members of the Longistics team, we pledge our complete commitment and adherence to all performance standards and procedures established in pursuit of our goals and objectives. We make this commitment to ourselves, and more importantly, we make it to our customers.